The Spartan MA.605 antenna is a low profile, heavy-duty, fully IP67 waterproof external M2M antenna for use in telematics, transportation and remote monitoring applications. 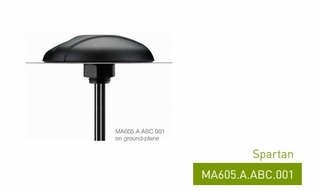 The Spartan MA.605 antenna is unique in the market because it combines 3in1 GPS/GLONASS, Cellular (2G and 3G) and Wi-Fi antennas in a heavy-duty structure with high efficiency in a low profile compact format. The antenna screws down permanently onto a roof or metal panel and can be pole or wall-mounted. Antenna includes a high isolation gasket to reduce risk of high voltage current on the mounting area, which prevents metal area short circuiting through the cable. For industries such as commercial vehicle telematics, remote monitoring, smart meter systems, construction equipment, at only 40mm high, the Spartan provides an unobtrusive, robust, rugged antenna that is durable even in extreme environments. Custom designed integrated wall mounted and pole mounted brackets are available for the Spartan antennas. These patent pending mounts allow for 180 degrees freedom of movement of the antennas for ease of positioning while also preventing access to the cables so they cannot be cut by vandals or thieves and also protecting the cables from long term weather exposure. The removal of unsightly cables also leads to a cleaner more professional installation and look, and makes the antenna less identifiable and more unobtrusive. Customized cable sleeves can be supplied for extra protection where required.